Roit Dahan, Phd., living in Tel-Aviv. She is a member of the teaching committee of the Israeli Institute of Group Analysis. She is a Group Analyst, and a Lecturer in Philosophy and psychoanalysis. 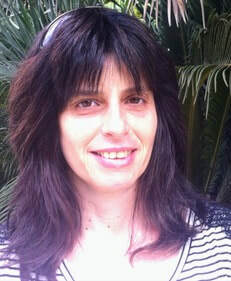 Works in her private practice in Tel-Aviv, and teaching in the Israeli Institute of Group Analysis, and in several academic institutions in Israel. Roit conduct workshops combining reading philosophy text and group analysis. Specializes in ethics in philosophy and psychoanalysis. She gave lectures in the 16'th European Symposium in Group Analysis: Art Meets Science, Exploring Challenges and Changes: "Science, Art and Ethics in Analytic group Therapy".